Our Lady of Guadalupe Rosarians, a pro-life coalition in Spring Valley, New York, has been working tirelessly for four years to end abortion in the area. 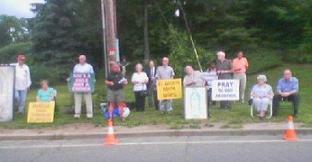 The group maintains a daily presence on Perlman Drive, outside Planned Parenthood. All welcome. For current info, please email Richard Bruno at pax45@optonline.net.